The work of CSIRO’s dynamics and predictability group, led by Jorgen Frederiksen, has significantly advanced our understanding of the major modes of atmospheric behaviour. the classes of convectively coupled equatorial waves. These theories have been applied to understand climate variability and the causes of recent climate change over Australia. The group has contributed to new strategies for improved weather and climate prediction and to better climate models through better representations of subgrid-scale processes. The group’s statistical mechanics theory of climate states and stable coherent structures has found wide application both in atmospheric and oceanic dynamics and also to science more generally. Their advances in statistical turbulence theory have led to closures that are accurate at all scales and to new closures that apply to general flows interacting with inhomogeneous turbulence, Rossby waves and topography. The theory has been applied to problems in ensemble prediction, data assimilation and subgrid modelling. The atmospheric circulation exhibits variability on many space and time scales. The storms and high pressure systems seen on daily synoptic charts are probably the most well known atmospheric disturbances that we encounter in mid-latitudes. But there are many other phenomena that affect the weather and climate of particular regions. Blocking, which prevents the regular eastward progression of low pressure storms and high pressure systems is one of the most important determinants of mid-latitude weather and climate. 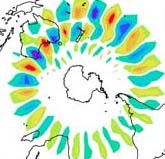 Large-scale low frequency anomalies or ‘teleconnection patterns’, such as associated with the El NiÃ±o Southern Oscillation, affect the weather and climate on a global scale and contribute to the droughts and floods that are characteristic of eastern Australia. Again in the tropics there are severe weather systems such as tropical cyclones, as well as monsoonal disturbances, intra-seasonal oscillations, north-west cloud band disturbances and classes of equatorial waves that account for weather and climate variability. These large-scale coherent structures in turn interact with each other and with atmospheric turbulence in complex ways, as well as being influenced by the oceans and driving ocean circulations. The chaotic nature of these interactions is a challenge for weather forecasting and for seasonal predictions with coupled ocean-atmosphere models. With the general warming of the lower troposphere due to increasing greenhouse gases that has occurred during the twentieth century, the consequent changes in the large-scale circulation in turn affect the location and properties of the atmospheric transient disturbances that contribute to climate variability including droughts and floods. understanding their predictability and their interactions with atmospheric turbulence. Jorgen Frederiksen (the first member of the group), started these studies in 1975, when he was appointed to the then Division of Atmospheric Physics by its Chief, Dr Brian Tucker, after completing doctoral and post-doctoral studies in theoretical physics. One of the big issues at the time was to explain the structures of atmospheric storm tracks. The theory of ‘baroclinic’ (vertical shear) instability had been developed by JG Charney (1947, J. Meteor., 4: 135-162) and ET Eady (1949, Tellus, 1: 33-52) to explain storm formation in simple flows using a so-called beta-plane approximation in which the spherical geometry was replaced by a local planar geometry. The theory captured the basic mechanism but did not account accurately for latitudinal variations. More importantly, the basic state flows on which the storms grew were uniform in longitude. These basic states did not represent the three dimensional structures of the observed atmospheric flows nor did the theory explain the geographical regions of preferential development of storms or the structure of the storm tracks. The theory of localised cyclogenesis and storm track formation was developed by Jorgen Frederiksen (1978, 1979 and 1982) initially using basic states that were idealised representations of Northern Hemisphere climatological flows. The storm tracks were found to lie slightly downstream and poleward of the regions of maximum vertical shear of the eastward winds in agreement with observations of ML Blackmon (1976, J. Atmos. Sci.,33: 1607-1623) (see Fig. 1 below). The theory of localised cyclogenesis was rapidly accepted by the meteorological community and Frederiksen was invited to spend most of 1980 at the National Center for Atmospheric Research in USA where he generalised the theory to observed basic states and more complex models. (c) standard deviation of band pass filtered 500 hPa geopotential height fluctuations from the observations of ML Blackmon (1976, J. Atmos. Sci.,33: 1607-1623). Another big issue at the time was to explain the mechanisms responsible for blocking. Many mechanisms had been proposed but Frederiksen was of the view that blocking should be explicable through a variation of the theory of storm track formation; indeed that there should be a unified theoretical framework for all the large-scale atmospheric disturbances. The break-through came when examining the structures of the fastest growing disturbances as the model atmosphere was made more stable; the leading mode switched from a monopole storm track wave train to a dipole wave train located upstream of the region of blocking over the Pacific Ocean. Further work also discovered larger scale patterns in the blocking region and lead to an essentially two stage development process for blocks. The first stage involves the growth of dipole structures due to baroclinic instability upstream of the blocking region, the disturbances then propagate downstream, increase in scale, and in the second stage amplify due to essentially ‘barotropic’ (horizontal shear) instability. This work on blocking and storm tracks was published in 1982 and 1983 (Frederiksen 1982, 1983a and 1983b). The predictions of the theory were subsequently confirmed in many observational studies, including by RM Dole (1986, Adv. Geophys., 29: 31-69) and it has become the generally accepted explanation for block development (Barry RG, Carleton AM, 2001, Synoptic and Dynamic Climatology, Routledge, 620 pages) (see Figs. 2 and 3). The results also lent credence to the idea that three dimensional instability theory should be able to provide a unified approach for studying the generation mechanisms of most large-scale atmospheric disturbances. Left panel: Fig. 2a. Pacific-North American winter blocks showing 250 hPa streamfunction for onset-of-blocking mode. Right panel: Fig. 2b. Pacific-North American winter blocks showing 250 hPa streamfunction for mature blocking mode in theory of Frederiksen (1982 and 1983). The theory was also used to explain the structures of Southern Hemisphere storm tracks and blocking and, with Robert Bell and Peter Webster, the major modes of Northern Hemisphere variability including the primary teleconnection patterns (Frederiksen and Bell, 1987; Frederiksen and Webster, 1988). tropical disturbances, such as monsoon disturbances, intraseasonal oscillations (Frederiksen and Frederiksen 1993a, 1993b, 1996, 1997) and the classes of convectively coupled equatorial waves (Frederiksen 2002). Despite being discovered in 1971 and being the most important mode of tropical sub-seasonal variability there has been no satisfactory theoretical model of the Madden-Julian intraseasonal oscillation (MJO). In the theory of Frederiksen and Frederiksen the MJO is a coupled tropical-extratropical mode generated by moist baroclinic-barotropic instability. In recent years, there has been increasing support for this proposal, including from the observational work of DM Straus and RS Lindzen (2000, ‘Planetary-scale baroclinic instability and the MJO’, J. Atmos. Sci., 57: 3609-3626) confirming the role of planetary scale baroclinic instability in the genesis of the MJO, and from a number of model simulations. Again, there is close agreement between the dispersion relationships, structures and propagation characteristics of the theoretical equatorial waves and oscillations and Wheeler et al.’s observational results (Wheeler M, Kiladis GN, Webster PJ, 2000, ‘Large-scale dynamical fields associated with convectively-coupled equatorial waves’, J. Atmos. Sci., 57: 613-640). Recently, a theory of the drying of southern Australia and the dramatic reduction in SWWA winter rainfall and stream flow since the 1970s has been developed together with Carsten Frederiksen (Frederiksen and Frederiksen, 2007). The cause of the rainfall reduction has been of major concern but until recently has eluded convincing explanation. It has been shown that it is due to a large reduction in the intensity of cyclogenesis and the southward deflection of some storms. In turn, this is due to a weakening and southward spreading of the subtropical jet stream and a reduction in the latitudinal temperature gradient of the atmosphere. Some climate models with anthropogenic forcing, including increasing greenhouse gases, have been able to simulate this drying trend during the second half of the 20th century. These skillful models predict a continuing reduction in vertical shear of the subtropical jet (Fig. 3) and a drying of southern Australia with increasing greenhouse gases. Fig. 3. Projected changes in the (300-700) hPa July zonal wind difference, for the years 2080 to 2099 minus pre-industrial conditions. Results are from Frederiksen et al. (2010) and based on simulations of the MIROC medium resolution coupled ocean atmosphere model with greenhouse gases increasing according to the Special Report on Emission Scenarios A2. Of equal interest, and also of considerable practical application to ensemble prediction of weather and climate, has been to understand how errors in forecasts grow and become structurally organised in particular geographical regions. The work of Frederiksen and Bell (Frederiksen, 1989; Frederiksen and Bell, 1990) on error growth during cyclogenesis and block development showed that errors grow rapidly when dynamical development is rapid and take up structures similar to the growing dynamical modes. More recently Jorgen Frederiksen and Mozheng Wei (Frederiksen, 1997 and 2000; Wei and Frederiksen, 2004) developed a generalised theory of error growth and structural organisation on time evolving flows during weather forecasts. This work in turn has formed the basis of ensemble prediction schemes that have been implemented in the CSIRO and Bureau of Meteorology weather prediction models in conjunction with Mark Collier and Andrew Watkins, of the Bureau of Meteorology, (Frederiksen, Collier and Watkins, 2004). These methods result in a significant improvement in forecast skill at medium range and have also been employed to improve seasonal to annual climate prediction with a coupled ocean-atmosphere model (Frederiksen, Frederiksen and Balgovind, 2009; Frederiksen, Frederiksen and Osbrough, 2009). In conjunction with Grant Branstator of the National Center for Atmospheric Research, theories have been developed that explain the seasonal variability of large-scale atmospheric instabilities and global teleconnection patterns and their role in causing the boreal spring predictability barrier for seasonal prediction with coupled ocean-atmosphere models (Frederiksen and Branstator, 2001 and 2005). Developing a framework for the interactions of turbulence with coherent structures, such as those discussed above, and with large-scale flows, topography and Rossby waves is a major challenge. In general atmospheric flows are subject to forcing and dissipation. However, much has been learnt about unforced inviscid flows that also throw light on the more general problem. It was recognised by RH Kraichnan (1975, ‘Statistical dynamics of two-dimensional flow’, J. Fluid Mech., 67: 155-175) and R Salmon, G Holloway and M Hendershot (1976, ‘The equilibrium statistical mechanics of simple quasigeostrophic models’, J. Fluid Mech., 75: 691-703) that the climate states of unforced inviscid flows could be obtained semi-analytically using methods of equilibrium statistical mechanics. Jorgen Frederiksen and Brian Sawford (1980, 1981, 1982 and 1983) generalised these methods to flows on the sphere and were able to explain the behaviour of atmospheric circulation models with changing resolution, the structure of the low level atmospheric flow and the atmospheric angular momentum balance. Together with George Carnevale of Scripps Institution of Oceanography the connection was made between the statistical mechanics climate states, characterised by maximum entropy, and nonlinearly stable states (Frederiksen and Carnevale, 1986; Carnevale and Frederiksen, 1987). This work has subsequently found wide application in many areas of atmospheric and oceanic dynamics, planetary science, physics and mathematics as reviewed by AJ Majda and X Wang (2006, Nonlinear Dynamics and Statistical Theories for Basic Geophysical Flows, Cambridge University Press, 551 pages). Turbulence has been called the great unsolved problem of classical physics. RH Kraichnan (1959, ‘The structure of isotropic turbulence at very high Reynolds number’, J. Fluid. Mech.,5: 497-543) made a major advance in the statistical theory of homogeneous turbulence with his direct interaction approximation closure. Major outstanding issues have been to account for the indirect interactions that determine the correct inertial range behaviour and to generalise the closure to inhomogeneous turbulence interacting with general mean flows, waves and inhomogeneities such as topography. A rigorous treatment of the indirect interactions remains elusive. However, work by Jorgen Frederiksen and Tony Davies have shown that a one parameter regularization of the direct interaction closure gives accurate results at all scales and that the parameter is essentially universal (Frederiksen and Davies, 2004). Frederiksen and Davies (1997) also used statistical closure theory to develop new parameterisations of subgrid scale eddies, and together with Martin Dix showed that they significantly improved the performance of the CSIRO global climate model (Frederiksen, Dix and Davies, 2003). Recently, Frederiksen (1999) developed a computationally tractable statistical closure theory for inhomogeneous turbulence and applied it to study interactions of turbulence with general mean flows, coherent structures, Rossby waves and topography. In collaboration with Terry O’Kane the closure theory was implemented and applied to problems of atmospheric flows over topography, ensemble prediction, data assimilation and subgrid modelling (Frederiksen and O’Kane 2005, 2007 and 2008; O’Kane and Frederiksen 2004, 2008a, 2008b and 2008c). Further progress on the subgrid scale parameterisation problem was made in conjunction with Steve Kepert and Meelis Zidikheri using a stochastic modelling approach and applied to barotropic and baroclinic atmospheric and oceanic flows (Frederiksen and Kepert, 2006; Frederiksen and Zidikheri, 2008; Zidikheri and Frederiksen, 2008 and 2009). The work of the dynamics and predictability group has significantly advanced our understanding of the major modes of atmospheric behaviour with applications to explaining the causes of climate variability and of climate change over Australia. It has contributed to new strategies for improved weather and climate prediction and to better climate models through better representations of subgrid-scale processes. The statistical mechanics theory of climate states and stable coherent structures has found wide application both in atmospheric and oceanic science but also more generally. Advances in statistical turbulence theory have led to closures that are accurate at all scales and to new closures that apply to general flows interacting with inhomogeneous turbulence, Rossby waves and topography. The theory has been applied to problems in ensemble prediction, data assimilation and subgrid modelling. Much of this work has recently been reviewed in a book edited by Jim Denier, of the University of Adelaide, and Jorgen Frederiksen (2007). Frederiksen JS, 2009, Personal communication.